Cut chicken breasts in half horizontally. Coat with oil and sprinkle both side with Five Spice Powder and garlic salt. Grill over medium heat for 5 minutes on each side, or until nicely charred and cooked through. Chill for at least 1 hour. Cut chicken into bite-sized strips and place in a bowl with 1/3 of the dressing. 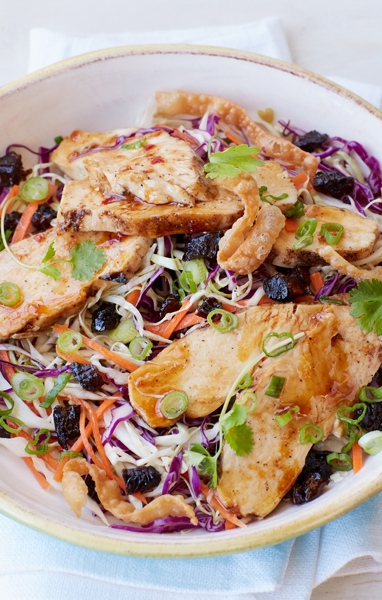 Place cabbage, carrots, diced prunes and green onions in a large bowl, then toss with remaining dressing. Transfer to four large salad bowls and top with equal amounts of chicken and won ton strips. Garnish with cilantro, if desired.